A Gareth Bale screamer and two goalkeeping howlers decided a fittingly tumultous final to what has been a topsy-turvy Champions league season. The second half of this final was the match while the first half is nothing but bad news for Egypt and Spain for the upcoming World Cup. Mo Salah walked off the pitch with what is being reported as a dislocated shoulder. If it was, then that means that Egypt will have to play the World Cup this year without him. He was followed by Dani Carvajal hobbling off the pitch. Then came the second half and Lorius Karius’ 45 minutes of horror. He first gifted the lead to Real madrid with a horrendous error and later allowed Gareth Bale to score his second goal of the night with another blooper. Between these Sadio Mane scored an eqialiser and Bale put Real ahead with a bicycle kick that can be described only through superlatives. He suspended himself in the air and potentially set his Real Madrid career back on track. 13th title overall, third title on the trot, the first team to do so since Bayern Munich in 1976, Zinedine Zidane the first manager to win the the title three consecutive times and the third to win it three times overall, Cristiano Ronaldo's fifth title thus making him just one short of record holder Gento; Real Madrid are the undisputed rulers of Europe. That's it from us, but if you have decided to stay awake, stick around. A whole lot of stuff has happened in this match and we will be bringing them all to you in some time. First half was all about Salah getting injured. There was Carvajal too but there is no doubt that Salah's participation, or non-participation in the World Cup is something that could affect an entire country. But then came the second half, which exploded with Karius gifting the first goal to a gleeful Benzema and Mane equalising for Liverpool. Then Gareth Bale with a bicycyle kick that will sprayed all over the internet by tommorrow and then another moment of horror for Karius. What. A. Night. Real Madrid become first team to win three consecutive titles since 1976. Liverpool players are inconsolable, Real Madrid players are emphatic. In this era of social media, this match has belted out a number of clips that have the potential to go viral. Three minutes added on. Ronaldo drives into the box and can take a shot but a fan seems to have run onto the pitch. Stewards drag him away from the pitch. 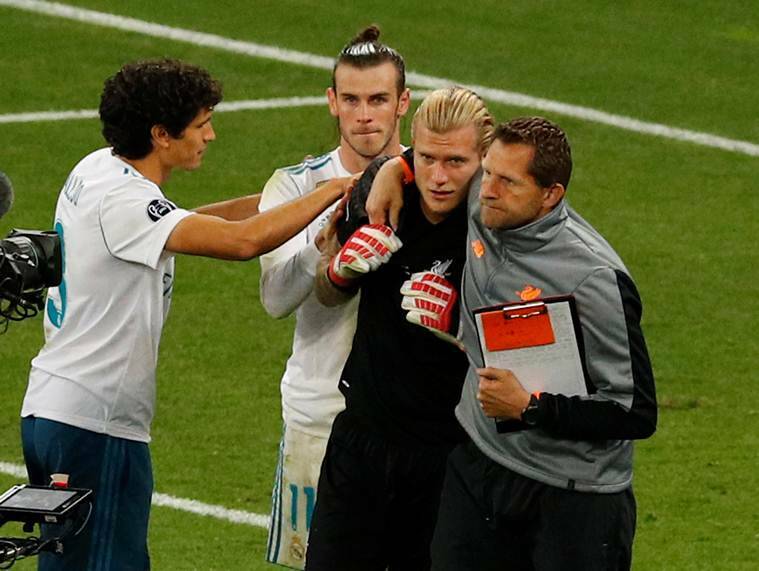 A night of horrors for Lorius Karius; a night of sheer joy for Gareth Bale. The match has turned on its head since he has come on. Bale cuts in from the right and takes a shot from over 30 yards out. It has power and it is swerving but it is straight into the outstretched hands of Lorius Karius, for a millisecond. After that millisecond, the ball just bounces out of his hands and falls over his shoulder and into goal. Bale takes off, he has been brilliant in the few minutes that he has spent on the pitch, Karius cannot find a place to hide. Firmino with a penalty appeal against Varane after the ball seemingly hits his elbow. Referee not interested and Real break, Ronaldo is in on goal and Robertson makes an inch-perfect tackle to stop him from scoring. Sadio Mane cuts in and takes the shot from outside the box. It is along the ground and Navas gets a finger tip to it before the ball hits the post and out. Milner takes the resulting corner and it is straight into the hands of Navas. Gareth Bale may have just put Cristiano Ronaldo in the shade. He scores through THE perfect bicycle kick and Real Madrid lead once again. Marcelo with the cross from the right and Gareth Bale had his back to goal. He rises, his legs go up and he meets the ball with, I repeat, THE perfect overhead kick. Zidane reacts like he has seen a supernatural occurence, just as he did when Ronaldo did it against Juventus in Turin. And Mane somewhat saves the blushes for Karius, Liverpool back on level terms. Corner that was lifted to the far post, Lovren beats Ramos to it and heads down the ball, Mane latches on to it and Liverpool back on level terms within four minutes. This match has exploded to life. Karius gifts the lead to Real Madrid. A humungous mistake from the Liverpool keeper and Karim Benzema scores. Kroos pases the ball and Karius collects it inside the box. He then looks the other way and tries to underarm a ball to Lovren it seems. Benzema comes rushing in and nips it as soon as the ball leaves Karius' hands and the ball goes into the empty net. There could never be a bigger mistake than that on a football pitch. 48 mins, Isco hits the crossbar! Real dominant in the early minutes of the second and Isco takes a shot from the edge of the box after Lallana's interception falls right on to his feet. It hits the crossbar and Isco has his head inside his shirt. Real Madrid kick off the second half. They were the first team to appear in the tunnel and Liverpool did take some more time. Oh, and it seems this happened as the players walked off the pitch after the half time whistle. Two shots on target, two injuries. That is the first half in a nutshell. It will be an absolute footballing tragedy if Mohamed Salah misses the World Cup because of this. Details are yet to come but replays do indicate that Sergio Ramos had brought down Salah on purpose. Whether he had a shoulder injury and a substitution in mind, only he would know. But the Spanish captain would do better than plan any trips to Egypt in the near, or even far, future. Back to some football then and Ronaldo heads a cross towards goal, Karius turns it straight back to Benzema who turns it into the net. But the offside flag is up. Replays show that Ronaldo was offside when the cross came in and Benzema was offside when Ronaldo took the shot it seems. The latter is unclear though. Dani Carvajal has walked off the pitch in tears after being injured too. He had walked off injured in the final last season too. Benzema finds Modric whose shot is blocked by Robertson. Benzema himself then takes a shot after receiving a pass from Marcelo and that is blocked by Van Dijk. Liverpool look a little rattled at the moment. 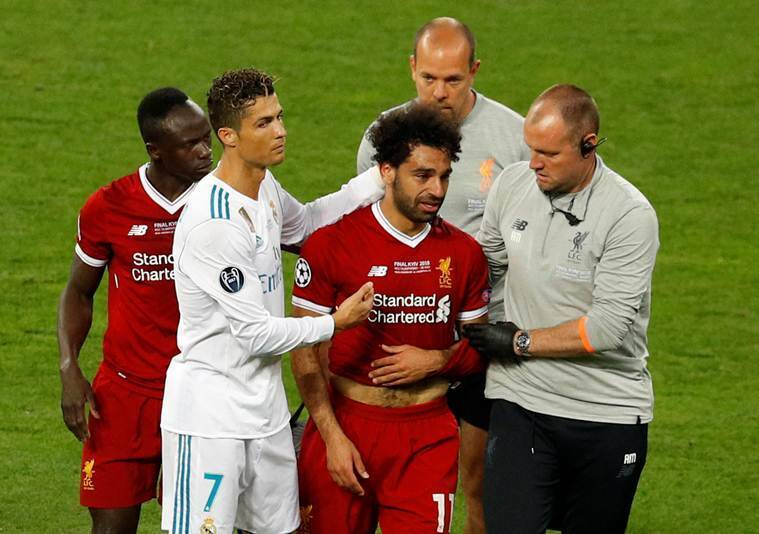 Cristiano Ronaldo, who had missed most of the final of Euro 2016 after being injured in the early minutes, gave Salah a consolatory pat on the head as he walked off. Salah comes back on momentarily but he goes down almost immediatly. Liverpool and Real Madrid players swarm around him and he is in tears. He then walks off the pitch, Adam Lallana replaces him. Wonder how much of a difference this will make tonight and, more importantly, to Egypt's World Cup campaign. Mo Salah falls awkwardly on his left shoulder after a challenge from Sergio Ramos. The medical team is on the pitch and he looks to be in some pain. But he does get back up and walks off the field seemingly asking for a spray. Milner cuts back to find Firmino whose shot is blocked off by Sergio Ramos. The ball then comes to Alexander-Arnold who comes running into the box from the right and takes the shot first time. Navas gets down in time to make the save. Van Dijk rises high for the corner and the ball is nicked away from his head by the hands of Keylor Navas. That was a nervous moment for Real Madrid. A period of Real Madrid possession comes to and end when Mane intercepts and tries to make a counter work. It doesn't happen and Varane blocks an Alexander-Arnold cross-field ball to give Real possession back. But the defending champions gift a corner to Liverpool, when Sergio Ramos passes it long to Carvajal who is caught by surprise and is nowhere near the path of the ball. Carvajal passes outside to Ronaldo down the right and the Portuguese moves in and takes a shot at the near post, it flies above the bar. He a few options to pass inside the box and he puts up an apologetic hand as he makes his way back. Real finally keep possession enough to actually bring Karius into play. Marcelo gets a bit more central after turning away from Milner and finds himself without anyone to pass it to, he ends up making a meek effort towards goal from almost 30 yards out and it rolls away safely past the byline without bothering the Liverpool keeper. Meanwhile, Karim Benzema is clutching his right right leg. Alexander-Arnold passes it inside to Salah from the right who cuts in and lifts it to Firmino, the Brazilian puts it back into the path that Salah and Alexander-Arnold are running on inside the box. Keylor Navas gets to it before either of them does. Liverpool hounding Real Madrid in these early minutes. Ramos fouls Salah on the right, the resulting free kick is taken by Milner after Salah runs over but he simply lays it into the Egyptian's path, Salah takes the shot from outside the box and it is blocked. James Milner kicks off proceedings at Kiev. Salah finds Wijnaldum who takes a shot from 25 yards out, blocked by Varane. Varane is in the thick of things again as he blocks off an Alexander-Arnold cross. There have been a glut of goals so far in the competition, particularly in the knockout stages and the start itself shows that the final is going to be no different. “We came here with a specific kind of football [big balls] and it would make no sense to play differently tonight. It is very tense; everybody can feel the size of the game. The challenge is to see it as a normal football game. W don’t need to be 1-0 up after two minutes; we cannot unsettle them with that. We need to be stable at the start. Dua Lipa is performing with Sean Paul after the players have been pushed off the pitch, hopefully after they have finished their warm up routines. The broadcasters have not done a great job with the sound systems so it all sounds a little out of tune. But this here is one heck of an image. Zidane will be deploying the 4-4-2 diamond and Klopp has gone for his gegenpressing group of players. Our preview had predicted that Zidane will have some back up for stopping Mohamed Salah whenever the Egyptian runs into spaces left behind by Marcelo. In fact, go ahead and give it a read, since there is some time left for the match to start. This is it! 124 matches, 397 goals all leading to these 90 minutes or more in the Ukrainian capital of Kiev. 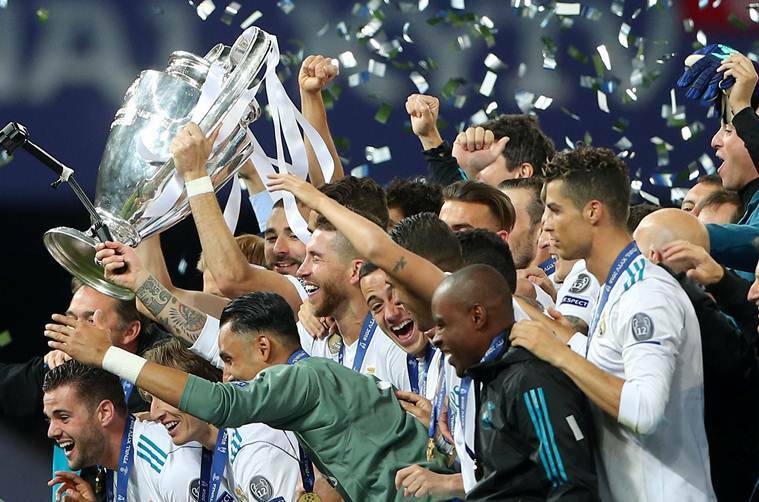 Real Madrid became the first team in over two decades to win the Champions League twice in a row last season. This year, they have chance of becoming the first team since Bayern Munich in 1976 to win Europe's elite club competition a third consecutive time. Zinedine Zidane could potentially be the first manager ever to lead a team to that many consecutive Champions League title and also match his predecessor Carlo Ancelotti and legendary Liverpool manager Bob Paisley in terms of the most wins in the competition. Liverpool will be looking to win a first title since that storied night in Istanbul in 2005 and, in the process, guard Paisley's record. This is also redemption time for Jurgen Klopp, who was on the touchline when his Borrusia Dortmund suffered a heartbraking 2-1 defeat to Bayern Munich in the 2013 final of the tournament. History, memories and goals on offer this evening then, let's get down to it. Real Madrid have faced Liverpool once in the Champions League final. That was back when the competition was called the European Cup and Bob Paisley's Liverpool won the Champions League making him the first to win the competition three times as a manager. Since then Carlo Ancelotti has matched this achievement and tonight, Zinedine Zidane stands the chance of doing the same. The Frenchman would also become the first manager to win the title three times on the bounce. Records and memories are on the offer today. 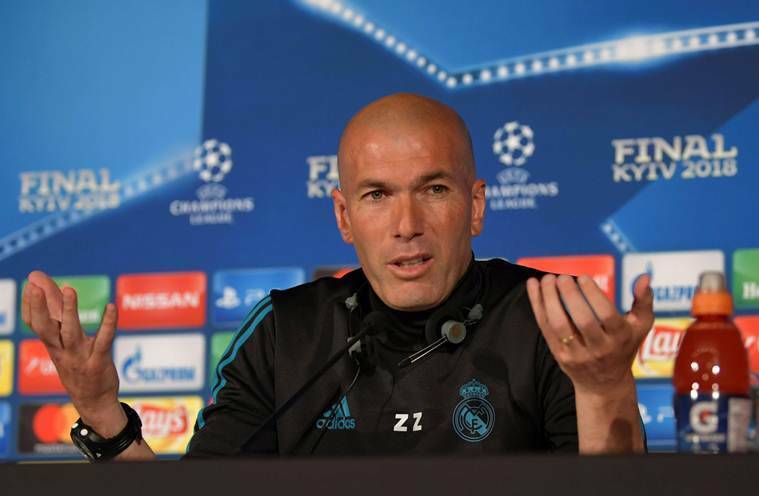 3 Champions League final, Real Madrid vs Liverpool: What tactics will Zinedine Zidane, Jurgen Klopp employ?